I was looking for a fast freeride fin. In 2007 I had Tectonics Falcon F1 fins (which are freeride fins). Chris Lockwood recommended these fins and I really like them. Last year I did a session with my Sonntag SL-S (an old competition fin) and I questioned myself if a freeride fin would make it easier for me to windsurf. Why easier windurfing? A lack of physical strenght, My job offers not much exercise and to be honest I am not motivated to go to the gym for an extra % windsurf performance. Last year after searching the web I found the Tribal Powermax. The fin is designed by Chris Lockwood, it is advertised as freeride fin. It is advertised as easy and fast. I decided to try the powermax (tuttlebox). The description (power, topspeed, stable) does fit the fin, its a fin you can abuse in extreme conditions. The first thing I figured was the fact the size of the powermax doesn't matter, at least not for comfort or control. However if you want to go fast, better take a small one. When looking at the fin selector at tribal fins I estimate you can take 2-4cm off the chart if you are going to sail for speed. 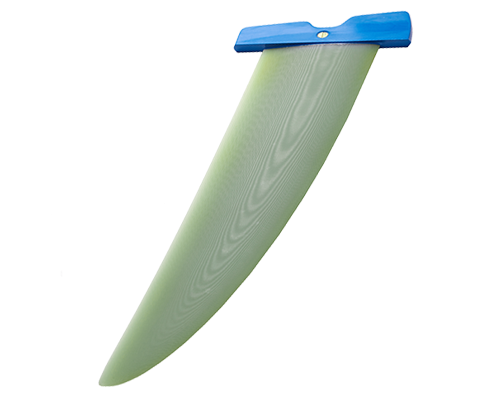 The best thing, the nose of the board doesn't drop with this fin, this makes it easy to accelerate and use each gust. The second best thing: this fin also rocks at sub 40 km/h speeds, if you are a bit tired it doesn't matter, this fin takes you home in control. I would recommend this fin for everyone looking for something simple. How does the Powermax compare to the Tectonics Falcon F1? Well I used the tectonics fin a long time ago. However I have a suspicion that the Powermax is better in windrange 12-30 kts, in really high wind it is (probably) still difficult to improve the Tectonics Falcon F1. The Powermax is easier to use. How does the Powermax compare to carbon competition fins? I use Sonntag Fins for a long time (7+ years now), these fins are carbon and do very well in competition slalom and speed. Last year I figured I got most of the time at 70~90% of the carbon fin performance at that moment (its not the fin, but me). In steady winds and waterstate a carbon competition fin will be most efficient, in good or perfect conditions these fins are my best ones. However in unsteady winds or waterstate it is a different story (4 out of 5 sessions). I use the freeride fin (Powermax) most of the time at 100% performance. The Powermax in light/medium winds at 100% beats every competition fin at 70~90%. Thats the power of the Powermax. Powermax is something you will like if you want to: spend more time windsurfing on the water (instead of waiting/resting), get good performance and not training in gym to be able to use you equipment all day. And yes you can overtake slalom stuff with a freeride fin. But most windsurfers know that (tectonics falcon f1 also did win my world cups in both speed and slalom).